Screenshots from an Oracle BI EE 11g analysis. 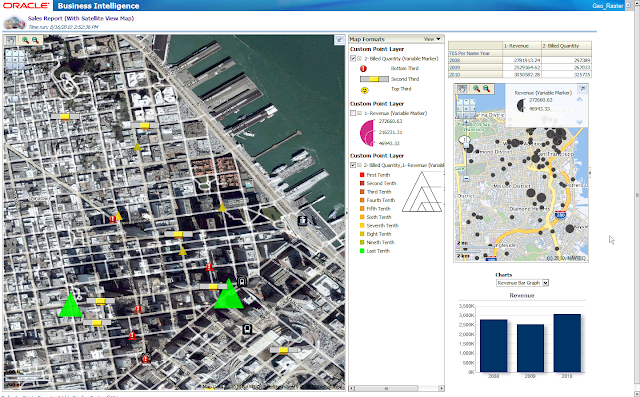 This analysis contains a Map View. Two in fact. But the biggest one is one displaying geo-raster imagery (popularly known as the "Satellite View"), with the raster data stored and fetched from an Oracle Database. The tiles have been generated and rendered by Oracle MapViewer. Also note the fact that you can choose to show or hide the different formats visible in the formats panel. I shall be writing extensively about these capabilities in the OBIEE 11g suite in the coming weeks.